It was my husband’s birthday this past weekend and I wanted to make party favors that were memorable and that friends could take away and cherish so I decided I was going to make a “Blast From The Past” playlist of music from the 80s/90s/2000s. Yes, I hate to admit it but I did grow up in the cassette era!! Loved those days! Too bad cassettes are obsolete now but I thought it would be fun to create cassette-style gift boxes and save the playlist on USB memory sticks so that everyone could access the songs readily. And that’s what happened. 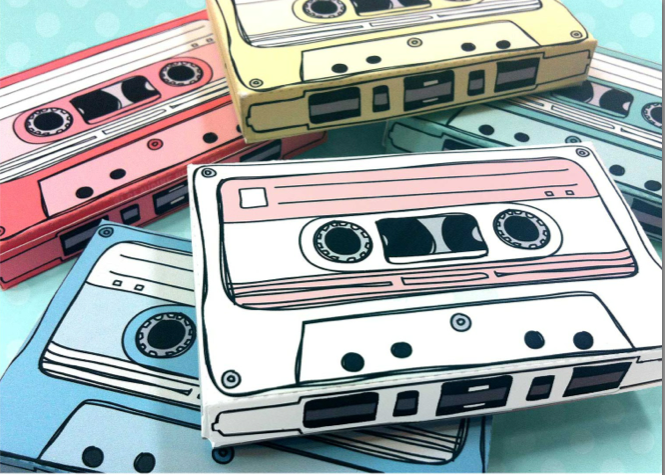 Pressed for time, I found these great ready-made printable D.I.Y Cassette gift boxes by illustrator Claudine Hellmuth via etsy.com. How much better could these get – I instantly purchased and downloaded the PDF’s and started to cut, glue and assemble each of the 30 boxes. I had the played list played over dinner so that guests could get a sneak peek of the songs.. and boy, did it take us down memory lane! 2. Prepare all your materials in advance. 3. Cut around the dotted lines and glue the corners of the box together. Let dry for 10-15 minutes. 5. Burn your playlist onto your USB stick and print out the playlist onto a small sheet of paper. I printed 6 playlists per A4 size paper. Fold in half and insert into box with USB stick. 6. Place final USB stick into cassette tape gift box with playlist and hand write your mix tape message on cover to give it a personal touch. 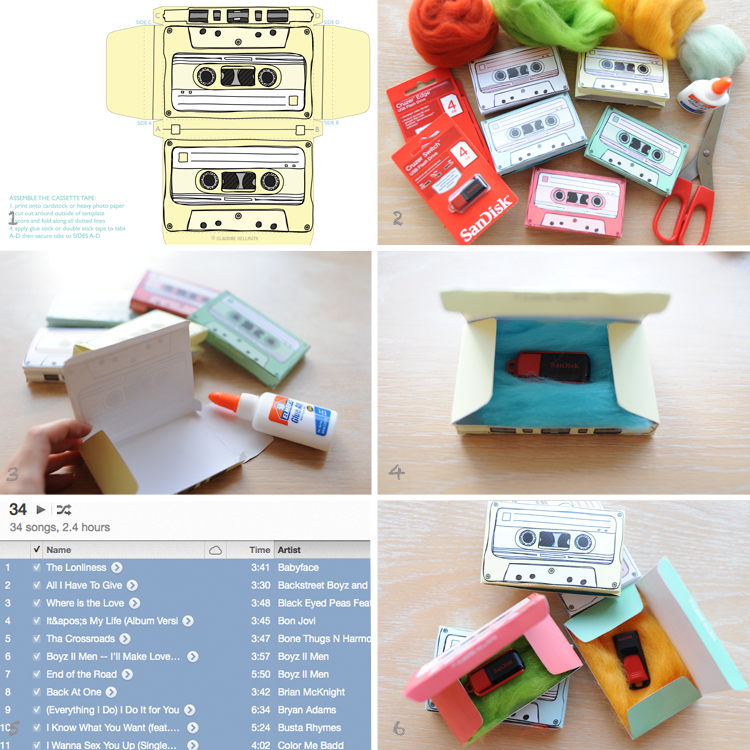 Tags: cassette tape gift box, party favor, USB Party Favor. Bookmark the permalink. Haha – Yes I certainly miss the days where friends made each other mix tapes! This was my way of reliving the past! 🙂 Glad you enjoyed the post and thanks for commenting! Means a lot!